...Dr. Jim Green – the Director of NASA's Planetary Science Division – and a panel of researchers presented an ambitious idea. 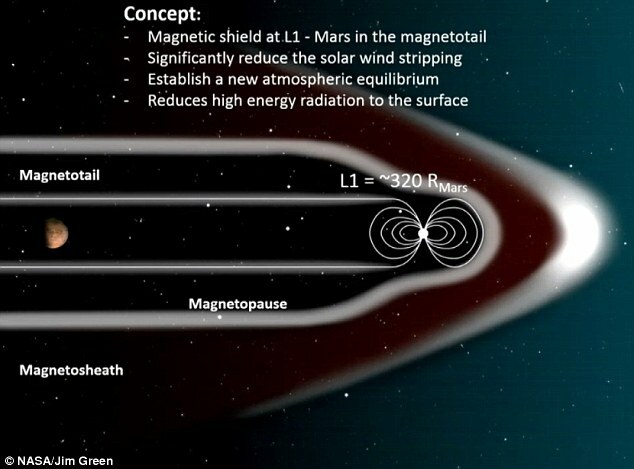 In essence, they suggested that by positioning a magnetic dipole shield at the Mars L1 Lagrange Point, an artificial magnetosphere could be formed that would encompass the entire planet, thus shielding it from solar wind and radiation. above: "The proposed method for creating an artificial magnetic dipole at Mars’ L1 Lagrange Point." Credit: NASA/J.Green From here. While using an artificial magnetosphere to preserve the atmosphere of a terraformed Mars may not be completely necessary, I think the intellectual exercise described in the article still has substantial merit, both for protecting smaller volumes (e.g. spacecraft, space stations, etc.) and perhaps even the Earth should the Sun ever find itself in a bad mood. Question: Is there anything I could read further about NASA's (or anyone else's) interest or research into artificial mini-magnetosphere's for protection of crewed spacecraft or space stations against radiation? I've been trying to find a link between the mini-magnetosphere actually created at Rutherford Appleton Labs (U.K.) in 2013 to NASA. So far there's only anecdotal reports and interviews none of which are conclusive as to NASA's involvement. RAL has a good bit of material published on the proof of concept magnetosphere and as far as I can tell is the only place such work has gone past theoretical models to a practical scaled model (that was very successful) so it would be surprising if there's been no contact with NASA. I'd also add that NASA did show interest in a group of researchers at CERN in 2014 working to develop an artificial magnetosphere using magnesium diboride superconducting magnets. The magnets are used in the LHC to create ultra-bright particle beams at a low temperature. Used in spacecraft shielding, they'd create a magnetosphere around the craft. As far as i can tell that research hasn't been publicly updated since mid 2015. Not the answer you're looking for? Browse other questions tagged crewed-spaceflight radiation shielding magnetosphere or ask your own question. Would working at night on the surface of Mars/Luna protect from radiation? Could an Apollo crew have been killed by Solar radiation? How do we currently protect astronauts and spacecraft from radiation?